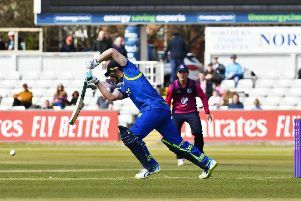 Hampshire took full advantage when their desire to bat first was granted by Durham’s acting captain Mark Stoneman in pleasant conditions at Chester-le-Street today. With the top five all passing 40, the visitors built on an opening stand of 160 to reach 319 for six at the close of the first day. After Jimmy Adams led the way with 86, greater riches were promised when Michael Carberry and the recalled Adam Wheater were putting on 73 in 15 overs for the fourth wicket. They took 28 off the first five overs with the new ball, only to depart in quick succession. Having played himself in carefully in his new role at No 4, Carberry moved impressively through the gears to reach 48 before he shaped to pull Graham Onions from outside off and bottom-edged into his stumps. A straight drive by Wheater gave him his seventh four and took him to 44 off 40 balls. But his attacking instincts left him in no position to deal with some skiddy extra pace as Barry McCarthy’s next ball pinned him lbw. McCarthy, who will shortly be on Ireland duty again in the one-day series against Afghanistan, shared the second new ball in the absence of Chris Rushworth. After bowling 16 of the first 40 overs as Durham desperately sought a breakthrough Rushworth was off the field for the rest of the day. He conceded only 30 runs and beat both openers several times, although the greatest scares came in the first four balls. Jimmy Adams, sent back when almost halfway down the pitch after Will Smith played to mid-wicket, would have been out had the throw throw hit the stumps. Then Smith went perilously close to playing on. Adams drove nicely through the off side and had a couple of leg glances among the eight fours in his 76-ball half-century. Smith needed 121 balls to reach his 50 and continued to leave the many balls wide of off stump before nibbling at one which left him in Keaton Jennings’ second over of gentle medium pace. Smith was caught behind for 67 and Adams drove a head-high catch to Jennings at mid-wicket off McCarthy. Tom Alsop played well for 40 before off-spinner Ryan Pringle hurried one through to have him lbw to bring in Wheater, who twice reverse-swept Pringle to the boundary. Jennings, deputising at first slip for the injured Paul Collingwood for much of the day, clung on at the second attempt late in the day to remove Ryan McLaren, giving Paul Coughlin a wicket in his first championship appearance of the season.